When you’re building a luxury deck, you’re not just renovating your home – you’re making a stylistic statement. Composite decking is the material of choice for homeowners looking to create a visually stunning deck that will last a lifetime but also requires relatively little maintenance. Designed to be the ideal material for luxury decks, composite is understandably taking its place as the most popular material used in deck construction today. As an experienced composite deck builder, we know that building true showpiece decks begins with the best materials. Because of this, we use Trex, the world’s number one composite decking brand. Environmentally responsible as well as beautiful, Trex decking material is durable, solid, and high-performance – and will stay that way for many years to come. This is because Trex uses their proprietary technology to combine the natural beauty of reclaimed wood with the lasting ruggedness of recycled plastic. Charlotte Decks and Porches has earned a reputation for designing and creating showpiece decks out of this superb composite decking. As craftsmen who are experienced at working with composite, we can design and build the advanced custom decks that other contractors tend to shy away from. We begin every project by providing our clients with a fully 3D rendering of what their deck will look like – before they sign the final contract. So, what are you waiting for? Are you ready to take the next step? 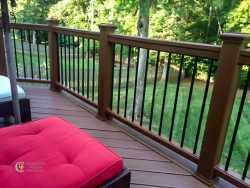 Contact us today and let’s talk about building your dream composite deck.